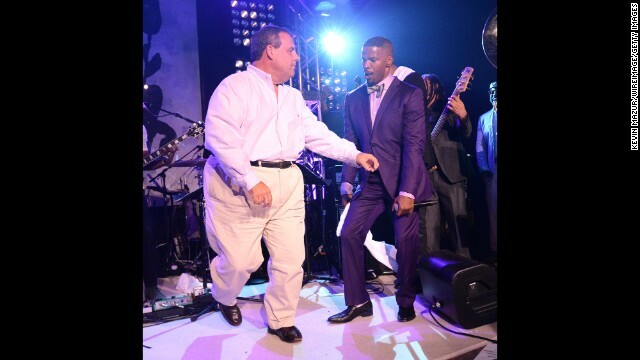 The New York Post has video of Christie busting a move on stage with Jamie Foxx at a benefit for the Apollo Theater. Also in the crowd: Barbra Streisand, James Brolin, Paul McCartney, Jack Nicholson, Anjelica Huston and Robert DeNiro, according to the Post. Christie, a potential presidential contender, was a guest of rocker Jon Bon Jovi, who also recruited the governor to help him complete the Ice Bucket Challenge this weekend. Christie wasn't the only Republican strutting his stuff Saturday. Sen. John McCain also hopped on stage with Foxx to perform the robot dance, the Post reported. "I saw Chris Christie and he was jamming," Foxx said, according to the Wall Street Journal. "I looked down at McCain and he was like, 'I can do this.' It's the ones you don't expect. It's the Republicans. Republicans love to dance in the Hamptons." In June, after his dance-off with Fallon, Christie predicted his moves would be in high demand. "I got a feeling that these dances now will be frequently requested no matter where I am - the next wedding, the next bar mitzvah," Christie said on a radio program. Christie said his son told him: "See Dad? See how many hits you can get if you're willing to humiliate yourself on national television for five minutes." Jamie Fox should be ashamed especially having his picture taken with McShame. Why. He's an entertainer. That's what they do. I would've paid money to see that!! "He's a dancing, dancing, dancing machine, watch him get down, watch him get down....."
ThinkAgain - Don't like Congress? Get rid the repub/tea bag majority. @Rogue351: "Jamie Fox should be ashamed especially having his picture taken with McShame." Or perhaps Jamie is as sly as a foxx – we all know how repubs try to eliminate each other by flashing pictures around of other repubs with dems and/or people of different "continental origins." Ah, their delusions of grandeur. Glad to see the stage didn't collapse. As far as the old man from AZ he already did his fumbling around during one of the debates and. Ant imagine he dances any better than that either. Does he think this will win him votes? Christie doesn't look any lighter to me and Mcshame doesn't look any smarter, as usual. Bon Jovi invited Christie? Wow...I've just lost a lot of respect for him. Bon Jovi has always supported NJ, including his efforts to raise funds for Sandy victims (those same people Christie kept funds from unless their mayors played ball). I for one can not wait for Christie's term to be up and to vanquish into obscure nothingness, as he surely won't win the Presidential race. "You can keep your Healthplan" and "You can keep your Doctor"
Good for Jamie...trying to heal a bunch of old wounds that have been continually re-opened the last 5.5 years with Obama. Enough with the race bating and the hate. Liberals despise seeing people enjoy a few moments. If there's no race bating or hate involved – then it's just plain evil to them.